When we were growing up we were told that stealing was unethical. Lying was a sin. Smoking and drugs could kill. So could alcohol. More so, alcohol and driving. These were black-and-white behaviors that were never virtuous and so although children rebelled, there was no counter argument that could negate the adult warnings. Cancer was real. OD was real. Alcohol induced brain fuzz was a measurable metric. The area of technology use is, however, hardly black and white. It is not even gray, but carries with it the splendor of the rainbow. For example, while that ubiquitous little piece of technology, the mobile phone, could potentially save lives, sometimes even literally, such as in the case of the store clerk whose phone absorbed a bullet aimed at his abdomen, and figuratively, like helping the adult keep track of the child’s whereabouts and activities, the danger associated with misuse or use of the gadget at an inappropriate time is very real. 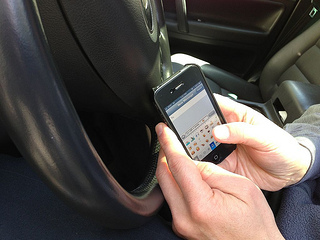 Topping the list of cell-phone induced dangers is texting while driving. “It is common sense”, one may exclaim in exasperation, “that reading and texting while driving is dangerous. Isn’t the warning superfluous?” The response to that rhetoric could lie in some mind boggling numbers. According to a 2014 Harrison Poll, more than a logical number of Americans admitted to reading (45%) and sending (37%) text messages while driving. This number is disturbingly more than drivers who drink and drive (37%). The US Department of Transportation reports that at any given moment across America, approximately 660,000 drivers are using cell phones or manipulating electronic devices while driving. 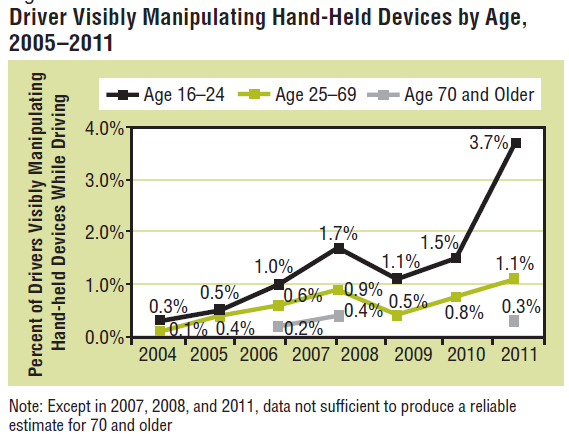 Age appears to be no bar for distracted driving, as can be seen from the data by the US department of Transportation, reproduced below. According to the US government’s distraction.gov site, eleven percent of drivers aged 18 to 20 who were involved in an automobile accident were sending or receiving texts when they crashed. In another survey by the Pew Research Center, 40% of American teens claim to have travelled in a vehicle where the driver used a cell phone while driving. The danger of texting while driving is three-fold. The opposable thumbs of the Homo habilis may have been an evolutionary leap that enabled the use of tools, but the restriction on the number of hands to two poses a natural restriction on the number of tools that can be simultaneously operated. The first lesson in Driver’s Ed that goes “Both hands on wheel” precludes the availability of limbs to operate the cell phone while driving, and any cell phone operation would point to a risky compromise on the number of arms on the wheel. Assuming for a moment that the shortage of limbs can be overcome, the more serious dangers come from the eye and the head. When travelling at a speed of 55 mph, taking the eye of the road for a mere 5 seconds to check an incoming SMS is the equivalent of driving blindfolded across the length of a football field filled with obstacles. The five seconds is literal eternity compared to the split second it takes to drive into one of the obstacles and at 55 mph, no impact could be trivial. The 100 billion neurons that process information at the rate of 1000 times per second may make the human brain a marvel, but contrary to claims of being able to “multi task”, the brain merely switches linearly among tasks. Neurons that are firing instructions to the fingers to fly over the touch screen are incapable of simultaneously alerting the driver to a possible barrier ahead. Is it any wonder then that the Virginia Tech Transportation Institute reports that heavy-truck drivers who send and receive text messages while on the road face a 23 times greater risk of crashing than the non-texters? An alarming finding by UK’s Transport Research Laboratory (TRL) is that drivers who read or wrote texts while driving fare worse than drunken and even drugged drivers in terms of alertness – reaction times deteriorated by 37% due to mobile texting/reading as against the 13% induced by alcohol and 21% by cannabis. Beyond the common sense dictate of not using cell phone when driving, governments around the world have imposed restrictions and bans on gadget use while driving. Many of these restrictions involve hefty fines and are directed at talking on the cell phone while driving, but the dangers of texting are being increasingly recognized, going by the quantum of fines imposed on texting violations. Within the USA, less than half of the states have an organized rule in place on the use of cellphones while driving, but that clearly is not a license to kill. While simple self-control is sufficient, use of #X in social media profile updates and use of apps to automatically respond to texts can go a long way in reducing a life to a mere datapoint on a disturbing graph.